It’s no secret that the Internet has become the world’s dominant communications network over the past two decades. It’s stunning rise to economic powerhouse has far surpassed the success of its precursor networks – telegraph, telephone and television. In the process, a handful of mega tech companies have overwhelmed the regulatory structure intended to foster innovation, growth and a market place open to all competitors. 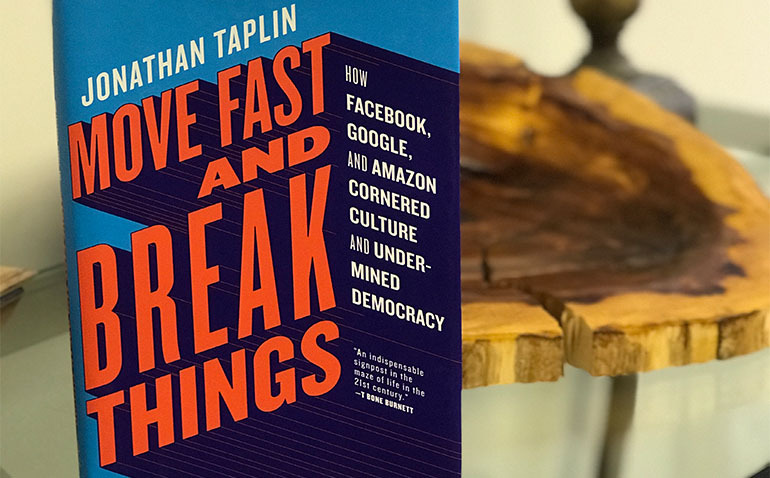 How this happened and what it means for the future of the Internet is the subject of Jonathan Taplin’s new book, Move Fast and Break Things: How Facebook, Google, and Amazon Cornered Culture and Undermined Democracy. It is an important read for anyone who spends time or does business on the Internet and for investors as well. The early days of the Internet featured “walled gardens” like AOL that offered a variety of content similar to sections of the newspaper, but that model soon succumbed to the wide-open, wild and wooly World Wide Web that proved to be a hot house for innovation, experimentation and startup companies. Most of the startups flamed out, but the growth and evolution of the Internet continued. In 2007, the advent of the smart phone with PC like capabilities was another paradigm shift that further expanded the role of the Internet as an economic platform. To casual users, the Internet today may look and feel the same, but those looks are deceiving. In recent years, the once wide-open web has seen “an extraordinary consolidation of Internet power” that has resulted in near monopoly status for Facebook, Google and Amazon. The once wide-open web is now dominated by three companies that have morphed their business models back towards the “walled gardens” of the 90’s. Google and Facebook together now have direct influence over 70% of Internet traffic. While known for search, Google has changed its focus to artificial intelligence (AI), with the goal of being the “knowledge Internet” company. Facebook has become the “social Internet” company and Amazon is the “e-commerce Internet” company. A reasonable metric to show just how dominant these companies have become is market capitalization, i.e. the number of shares outstanding times the share price. Alphabet (Parent of Google) has a market cap of $656 billion, Amazon $544 billion and Facebook $518 billion. That makes them the 2nd, 4th and 5th most valuable companies in the world. Apple is 1st at $870 billion and Microsoft is 3rd at $642 billion. That these relatively young, Internet related companies now dominate the world stock markets, begs several important questions. 1. Are we in another technology bubble? 2. Are the earnings and profit margins of these technology companies sustainable? 3. Should government regulators step in to insure competition in this most valuable of networks as they did a century ago with the big “trusts” of the Industrial Age? Taplin’s early days as a music, TV and movie producer give him a keen appreciation for the importance of copyright laws in protecting the creative work of artists in those fields. The book covers in great detail the proclivity of the big tech companies to run rough-shod over copyright laws put in place to protect content creators long before the digital revolution. There’s no doubt that the market power and growing political power of the big tech companies will be hotly debated in the years ahead. Move Fast and Break Things is an informative primer to the subject.